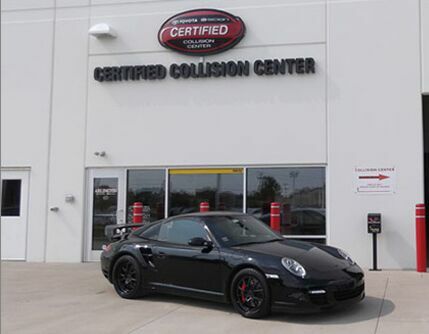 Take a walk around our collision center! The Collision Center at Arlington Toyota is equipped with all the latest and necessary equipment to restore your damaged vehicle, regardless of make or model, to pre-accident condition. The “Genesis Laser Frame Rack” using laser calibration technology will bring your car back to the factory exacted measurements. Then it's off to the one of our two down draft paint booths or one of our two down draft prep stations for painting. The Arlington Toyota-Scion Body Shop offers all a unique, relaxed family environment. Being family owned, you will find that from your estimate to finished like-new vehicle, an incredible level of personal attention and care. We specialize in delivering high quality work on time and within the budget. From the smallest fender-benders to major bodywork, our staff is knowledgeable, skilled and prepared to help you like no other bodyshop or Toyota Dealer in Chicago or all Chicagoland. Our work is guaranteed for as long as you own the vehicle! We also offer free shuttle service and a complimentary car wash with every repair. Our entire staff of technicians and management must maintain a high skill and knowledge level to operate a “Toyota Certified Collision Center”. We are proud to tell you that our Shop, Equipment and Technicians are all 100% Certified by Toyota. Toyota's Certification requirements are so high that you can be sure the work done all makes and models will be done by Toyota standards recognized around the world for high quality. Our management and administrative staff have great relationships with most major insurance companies. Their experience will help guide you though the maze of insurance paperwork required. An on site Hertz Car Rental facility insures you do not have to worry about alternative transportation. Hertz can bill most major insurance companies directly. When repairs are completed, your vehicle is inspected by the quality control team assuring the repairs have been done to your satisfaction. When your vehicle passes the stringent post repair inspection it will be completely cleaned both in and outside for the trip back home.